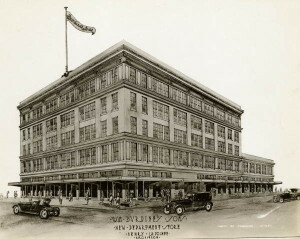 Famous for being the source for year-round “Sunshine Fashions,” Burdines department store was founded in 1896 in Bartow, Florida by William Burdine and partner Henry Payne. 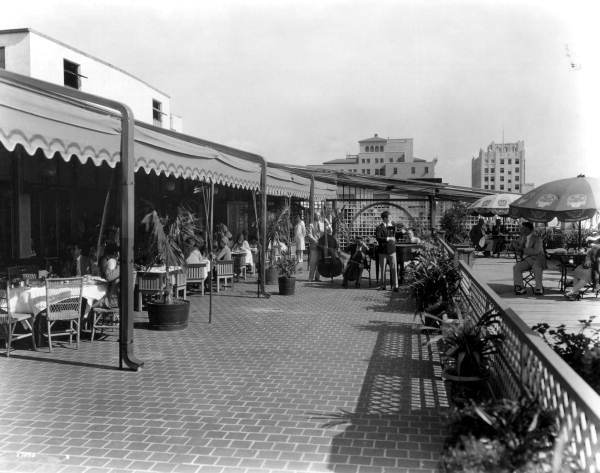 In 1897, Burdine moved to Miami and around 1900 opened W.M. Burdine & Son. After his father’s death in 1911, R.B. [Roddey] Burdine took over the family business. In 1912, the company expanded into a five-story building at Avenue D and 12th Street (now Miami Avenue and Flagler Street) in downtown Miami. 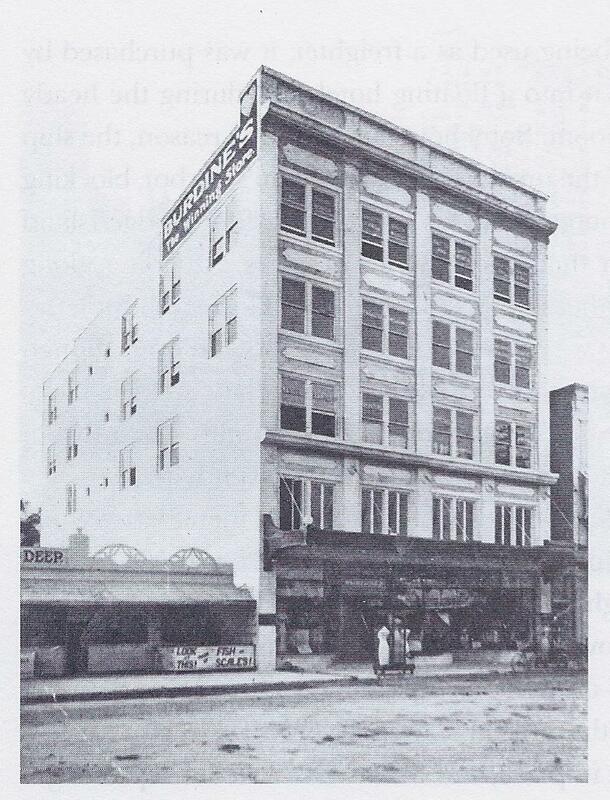 The building was located on the same block as the Biscayne Hotel, built by Joseph McDonald in 1902. Miami’s 1920s economic boom and increased tourism from Northern snowbirds demanded additional retail square footage. 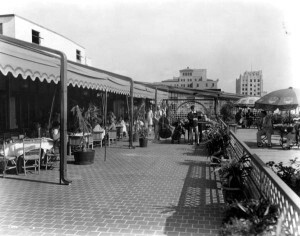 Following the 1926 hurricane, a canopied rooftop restaurant was added to further attract shoppers. 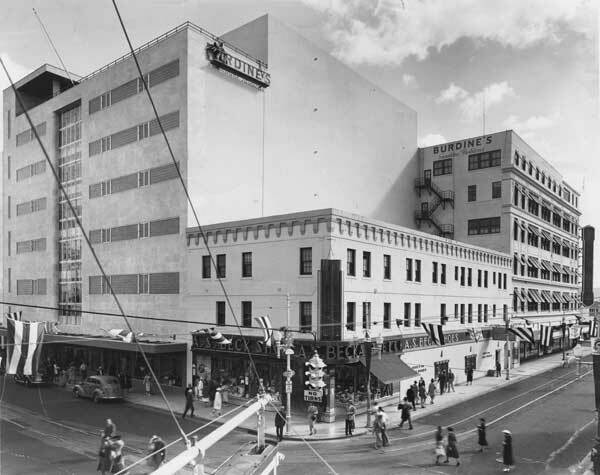 In 1936, the company purchased the remaining portions of the Biscayne Hotel and hired architects E.L. Robertson and J.R. Weber to rebuild and remodel the existing building, which opened to the public on November 13, 1938. 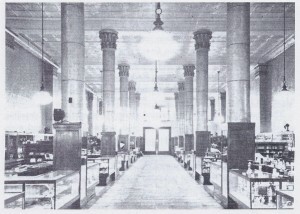 The project cost $1.5 million and was the company’s flagship store. In 1946, two additions (also designed by Robertson and Weber) were built, along with a three-level sky bridge that connected the main store to the addition across Miami Avenue. 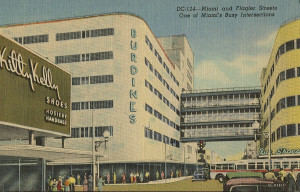 Burdines new architectural look included a modern façade of ribbon windows with inset panels of glass and glass block, plain walls, smoothly curved corners, and long horizontal lines; just some common characteristics of Streamline Moderne—an architectural Art Deco style that flourished in the 1930s and prevalent in Miami at the time. 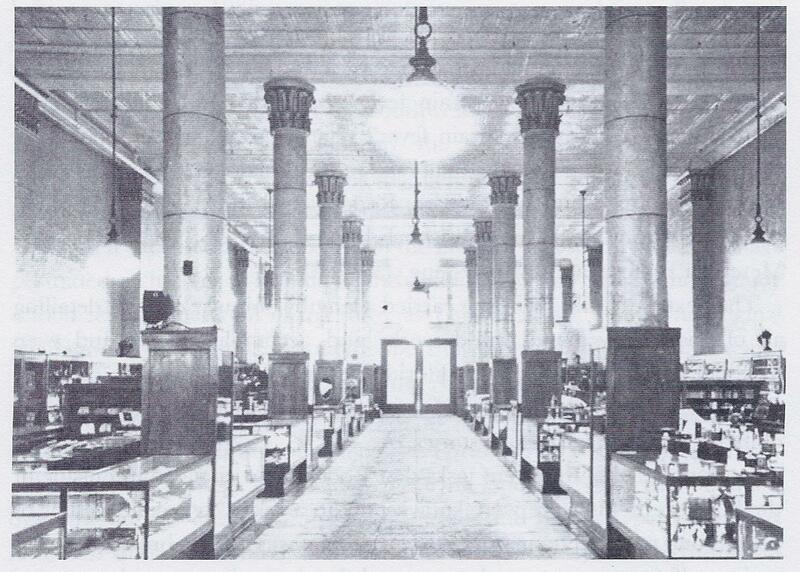 In 1956, Federated Department Stores, Inc. acquired Burdines, which brought financial stability and more store expansion throughout the state. In 2003, Burdines became part of the Macy’s brand, and formed the new “Burdines-Macy’s” until finally becoming Macy’s in 2005. 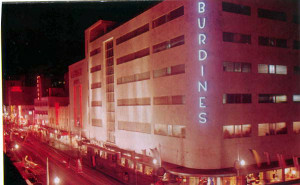 During the Burdines mid-twentieth century heyday, the building hosted a variety of events including runway fashion shows and visits by celebrities. It was also the site for sit-in segregation protests at the store’s lunch counter during the Civil Rights era. 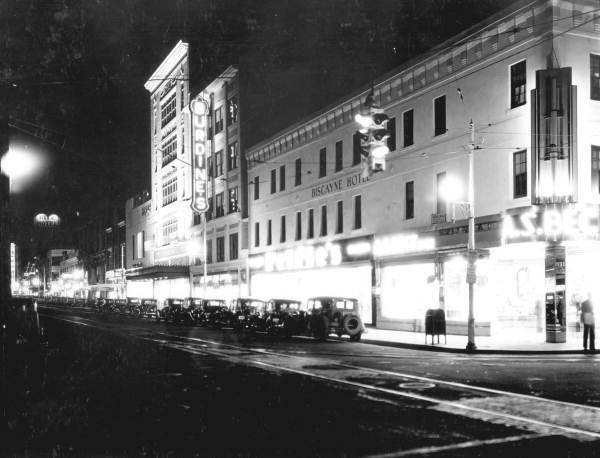 On November 24, 1950, the world’s largest neon Santa Claus—at 75-feet tall and mounted on the sky bridge over Miami Avenue—lit up the Miami holiday shopping season for the first time. This tradition continued until the early 1960s. 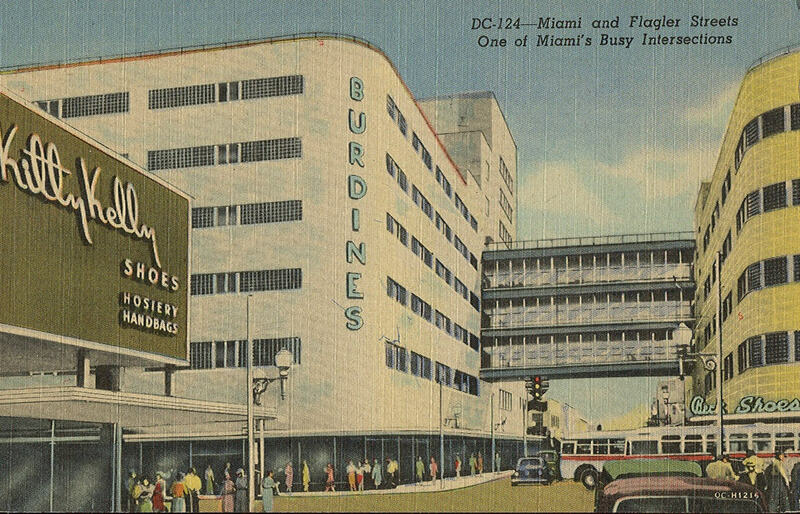 For an in-depth Burdines company history see Seth H. Bramson’s Burdine’s: Sunshine Fashions & The Florida Store. This entry was posted on Thursday, December 19th, 2013 at 3:38 pm and is filed under Architects, Architectural Styles, Art Deco, Downtown Miami, E.L. Robertson, Henry La Pointe, J.R. Weber, Miami, Neighborhoods, Photo Galleries, Streamline Moderne, Videos, YouTube Video. You can follow any responses to this entry through the RSS 2.0 feed. Both comments and pings are currently closed.